I was happy when I was in Manila. I had my boyfriend and had plenty of friends. Apart from being able to work in a corporate world, I also kept myself busy with my Church obligations. However, it felt like I got exhausted with everything that was going on back there. Maybe it has to do with getting stressed out at work and the environment. You know how it is in Manila. It's always a busy place. I just couldn't keep up any longer. It came to the point that I felt like I lost a part of myself in it. I wasn't happy anymore. I found myself longing to come back home. So I turned my back from Manila. I'm home and I really feel comfortable here. Although me and my mother still have a few arguments which I can deal with this time around, I really can't complain much. Anyway, there is our Brandon who lights up the mood whenever a conflict arises. He can let everyone forget about being angry just by opening his mouth or just by him being around. He is such an angel. With what's going on in my life right now, I realized that I keep finding happiness. And I kept looking for it in places when I can only find it from deep within myself. I have contemplated a lot since I came home. I have learned to take things easy and not to rush. I learned to relax. Being home with my family made me realize that they are more important than anything else in this world. I'm grateful that I am now here for them. 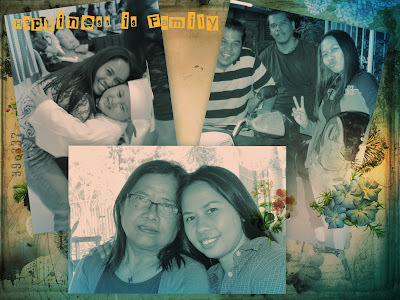 And by writing this post, I just realized that my family is my happiness. I have never liked Manila's lifestyle. I get lost in the throng and I feel that my other feet is 6-feet below the ground with the non-observance of traffic rules by the motorists. Anyways, I am glad you've found your way back to happiness, my not-so-little cousin, hehe! As the cliche goes. there's no place like home. Now you can make up for lost time and create more memories with them. Love and hugs from the Land Down Under!